The experience begins with being sat at a table of approximately 10 people. The waitress will hand you a hot white wash cloth to wash your hands. Then you will be served a bowl of soup followed by a house salad and then the main chef prepared meal. 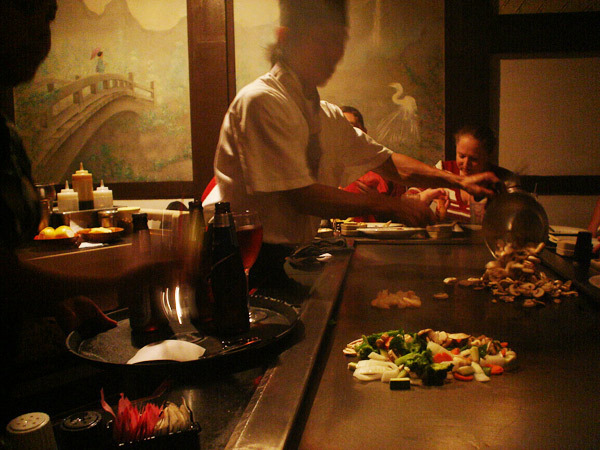 This Japanese restaurant has great food and is very entertaining watching your food be prepared right at your table. If you have a very animated chef it makes the whole experience more enjoyable as you can see in photos below! The food is delicious and served with rice and vegetables. Reservations recommended. There is also an Arigato’s in Clearwater, on US 19. The St. Pete one is better! Tell them SharingFlorida.com sent you!